Continuation from the previous post of Chalet Air Panas @ Pengkalan Hulu …. A little underwhelmed by the spread served in Chalet Air Panas, we took a most delightful detour to town in search for some food. REAL food. Our eyes spied on a few Chinese restaurants believed to serve ‘Dai Chow’ type of cuisine (Rice with Dishes, and Noodles), one being 126 Seafood Restaurant, another named Huang Chau which I’ll get to later in this post, and of course, Gong An Hainan Restaurant which also acts as a guesthouse, All three restaurants are situated on the main road of Pengkalan Hulu named Jalan Iskandar, hence locating them requires no complicated directions whatsoever. 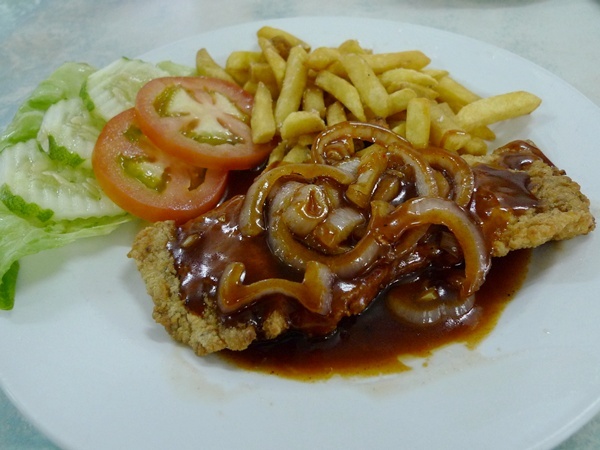 Succulent, fresh and sweet fillet of fish coated with their own crispy batter, and served with the sweet and tangy gravy with caramelized onions, and fries as well as mixed vegetables on the side. Gong An serves not only Hainanese fare such as the perennial favourite Hainanese Chicken Chop, but also Fish & Chips, Beef Steak (it was on the signboard, but my order of beef steak miraculously changed to Fish & Chips in the end. Hmm …), and various Chinese dishes. The Fish & Chips came freshly prepared, coated with a thin and crispy batter that did not stick to the flesh. Haphazardly coated? Nah … But very home-cooked style, with everything whipped up on the go, even the glistening sweet and sour gravy with lots of onions, and the stubby shoe-string fries. The fish was pleasantly devoid of fishy, or muddy taste, and the flaky and succulent flesh was a most relished experience. A little steep, at RM10 per serving, but well-worth the price paid. 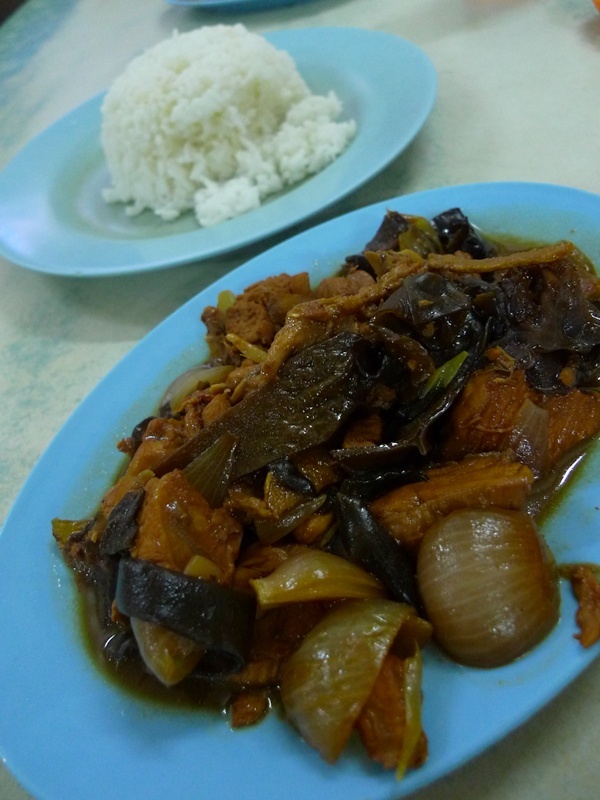 The special of the day (so to speak) was Soy Sauce Chicken with Wood Ear Fungus, one of the most heartwarming dish one can whip up, almost resembling my grandma’s style of cooking. The place may not have air-conditioning, nor exemplary level of customer service, but to be dining here was a most nostalgic experience in itself, almost akin to a family dinner in a long-forgotten yet familiar place. The floor was tiled with mosaics from the yesteryears, the furnitures retained their charm since more than half a century ago, and even the kitchen was built to be in full view of the customers. Opens daily from 11.30 am until 9.30pm. Close days not fixed. 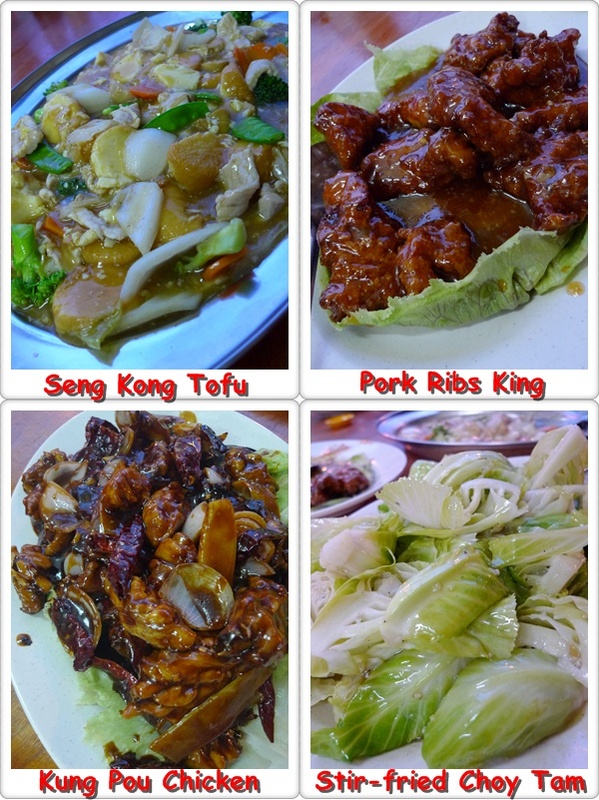 A few doors away from Gong An sits Huang Chau, a Chinese diner with a fair amount of customers and loyal patrons. Even on the evening we had our dinner there, some tables were booked, and even covered with red clothes, indicating joyous and momentous occasions being celebrated in the restaurant. And no, the eatery is not your typical idea of a fine dining outlet, nor even equipped with air-conditioners to start with. A meal for 8 came to about RM94, including rice and drinks. 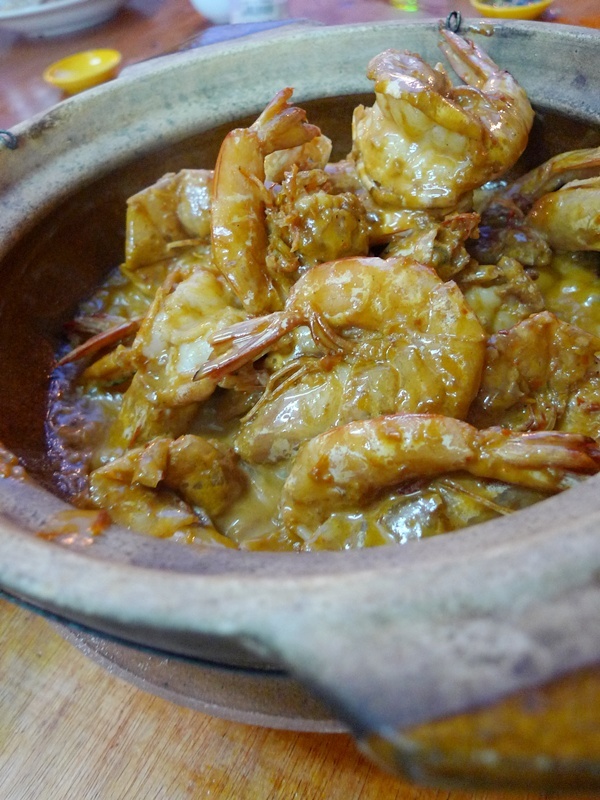 The Indonesian Prawns (RM32) came piping hot in a claypot, covered ever so decadently with those thick, creamy and delicious sauce. The gravy resembled yellow curry, minus the heat. The other dishes paled in comparison, with the “Pai Kuat Wong”, or literally translated to Spare Ribs King (RM10) leading the pack. The hint of turmeric in the marinade was not exactly a smart move, at least in my opinion. And far from fork tender, the lean pieces of ribs were a little tougher than desired. But still, the plateful of meat was polished off in mere minutes, ravaged by the hungry souls tormented by the lack of edible foods in the Chalet. The Kung Pao Chicken (Stir-fried Chicken with Dried Chillies) (RM16) was a forgettable affair, being nothing outstanding in comparison to the average ones in most Chinese diners. Still thinks the one at Lan Je in Rawang was possibly the BEST version I’ve had. The Seng Kong Tofu (Beancurd cooked in an egg-y gravy, with an assortment of vegetables and meats thrown in for good measure) was a little over-priced at RM15 per portion, though the gravy complemented the white rice well. The crunchy Choy Tam was lightly stirtfried with some chopped garlic, retaining their natural sweetness and crunch. By the way, what do we call them in English? Brussel Sprouts? Huang Chau Restaurant is a corner shop situated a few doors away from Gong An Restaurant, on Jalan Iskandar, Pengkalan Hulu, Perak. And last but not least, something to tempt that fidgety tastebuds of yours, or seeking for some Halal food? 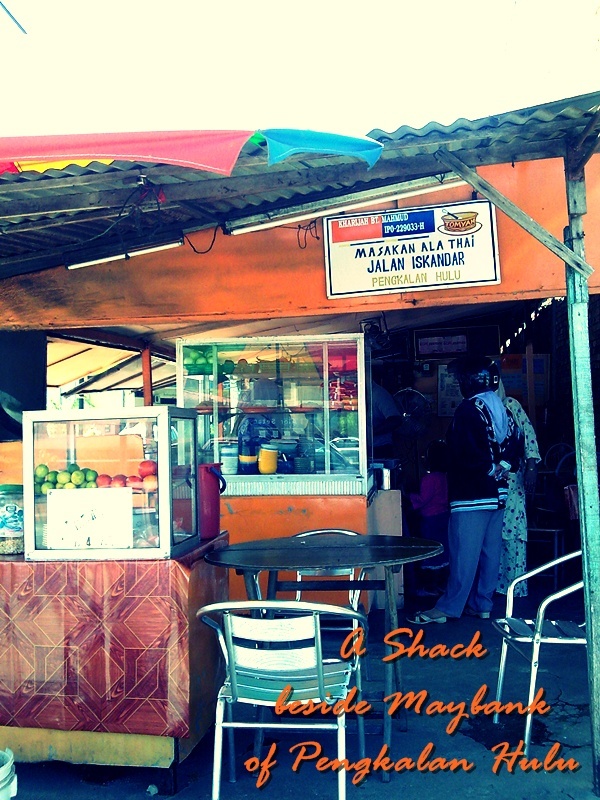 Then this shack of an eatery situated on the main road of Jalan Iskandar, Pengkalan Hulu may just do the trick. Kharijah bt Mahmud – Masakan Ala Thai, Jalan Iskandar is a most unassuming spot for a leisurely lunch, to be seated under the freaking hot zinc roofs with nothing but stand fans to cool you off. But you see the crowd, from all walks of life patronizing the place for some Thai-influenced Malay dishes come lunch and dinner hours. Though we found that the Tom Yum was anything but memorable, being a little diluted than what I would have preferred. And there were even fishballs floating on the surface. Hmm ……. The Daging Masak Merah (Beef slices in a Sweet & Spicy Gravy), Kailan Masak Ikan Masin (Salted Fish with Kale), and Telur Dadar (Egg Omelette stuffed with a sweetish combination of ingredients) were all staples of the routine Malay spread of dishes. The meal for four came close to RM40, a princely sum for a simple meal in Pengkalan Hulu. And this was more than ONE year ago, before we embarked on our journey to Betong, Thailand. Masakan Ala Thai Kharijah bt Mahmud is situated on Jalan Iskandar of Pengkalan Hulu, a few shops away from the only Maybank in town. You’ll see this shack before reaching Shell petrol station on your right. And there you have it. A simple roundup of all the food we have tried, tested, and came back alive after our meals, in Pengkalan Hulu. Any recommendations, suggestions, feedback, brickbats etc? The Indonesian Prawn looks nice too. yeah, the Hainanese in fact, were very good (and probably still are?) at cooking up Western dishes. eg. those Hainan restaurants such as Yut Kee in Jln Dang Wangi, Yut Sun in Taiping, Yut Loy in Kuala Kangsar, and this one in Pengkalan Hulu. my grandfather in fact, was as cook working with the British families way back during those pre-independence days. and he could cook up a storm literally, Hainanese and Chinese fare, as well as Western food. The Fish n Chip looks good la…definitely better than those dry Aussie style. The Indonesian prawns look tempting though. Don’t mind having only that dish with white rice. And lastly, you are a Hainanese? I’ve heard that 9 out of 10 Hainanese are…….very good cooks! .-= ahlock´s last blog ..Hidden Dangers Of Waterfall =-. Oh the food looks good… thought the one from Gong An doesn’t appeal to me at all. 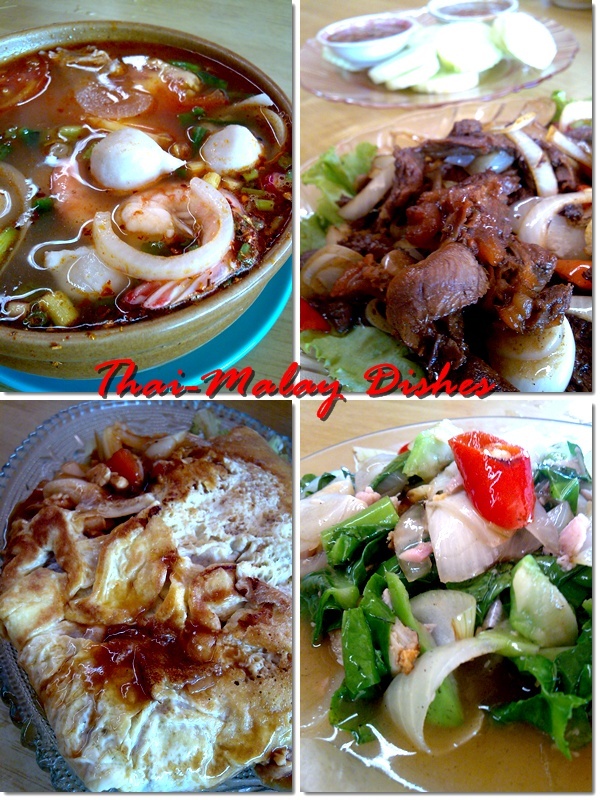 The Thai-Malay food looks good :). Huang Chau’s food made me hungry haha. Thanks for sharing all the good food! not appealing? there are a lot of other dishes there, trust me. I guess the shop used to be patronised by Ang Moy long long time ago..
Is it true if you speak Hainanese at the shop you will have special treatment…? erm, I can’t speak Hainanese la …. pathetic right? but I did use my best Cantonese (hehe) and got some courteous service. or maybe Hainanese are born friendly? erm, I only knew about Hainanese Chicken Chops and such after I start to appreciate my food, and eventually starting my blog last year. ever more the ignorant punk eh? the combination worked for me. yeahlah …… sigh. it was horrendous. even Maxis connection was jumpy, in certain area. 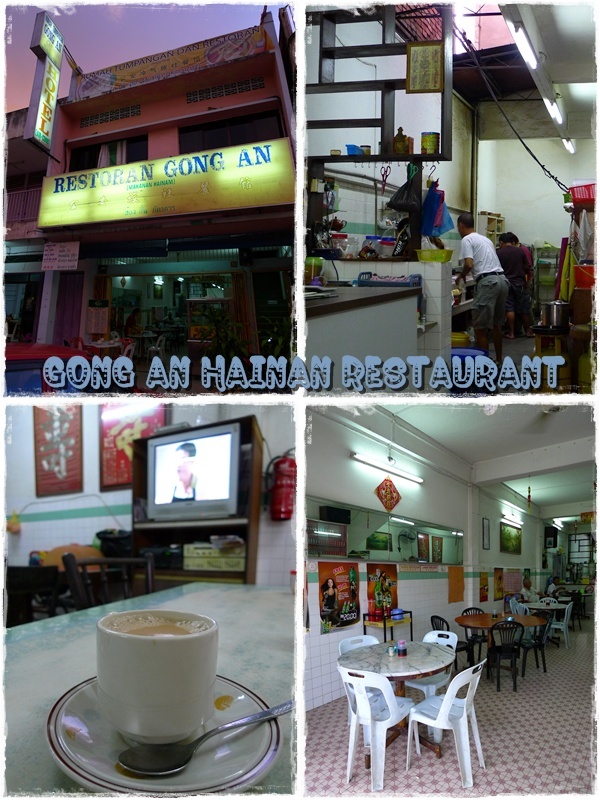 We can hardly find good Hainanese restaurant these days besides Yut Kee. haha. R u working in enforcement department or biro ya? Need to travel a lot? I love the look of the Indonesian prawns! They have santan in it eh? Must have been appetizing. .-= iamthewitch´s last blog ..Fancy a bowl of Pho? =-. yeah, a little milky and creamy. it was either santan or milk in the gravy. you are travelling always, i wan a trip too!!!! any good suggestion for a day trip? day trip from KL ah? erm, try kuala selangor/sekinchan? or just shop the day away …. hehe. no wonder kena rash ler.. 😛 poor u – take care!! 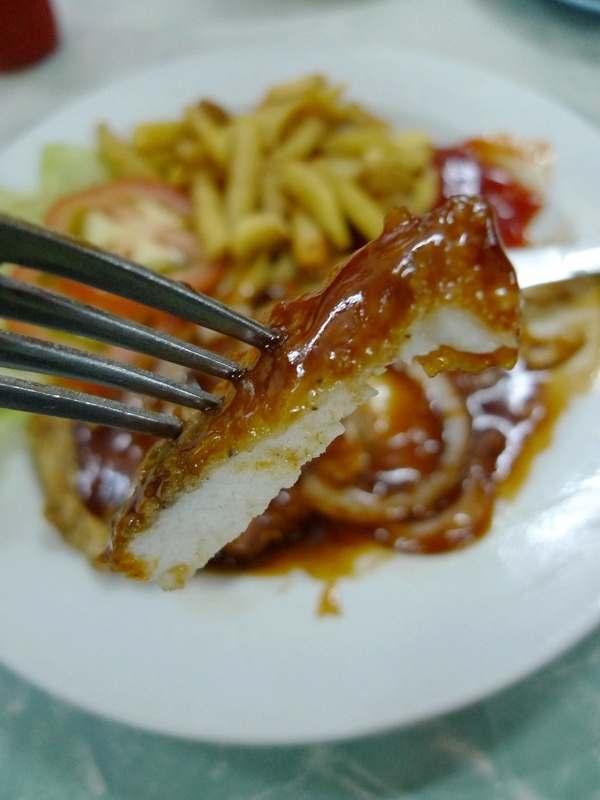 .-= cumidanciki´s last blog ..Kedai Makanan Chef Tam @ Selayang – the Sunshine Chicken =-. already updated. 😉 no problemo. hehehe ……. Oh my… *drool*… Those prawns look sinfully tempting…..
.-= J´s last blog ..Weekly Live Jazz – The Rapture @ Rama V, KL =-. Man, only u would stil be able to find such hidden gems in those areas like P,. Hulu. But heh, myself hardly been out of town area/cities but I got to come to Ipoh again soon! Miss the plc di! fresh fish fillet was used instead of those frozen dory fish fillet?? fish and chips in Pengkalen Hulu-great find.